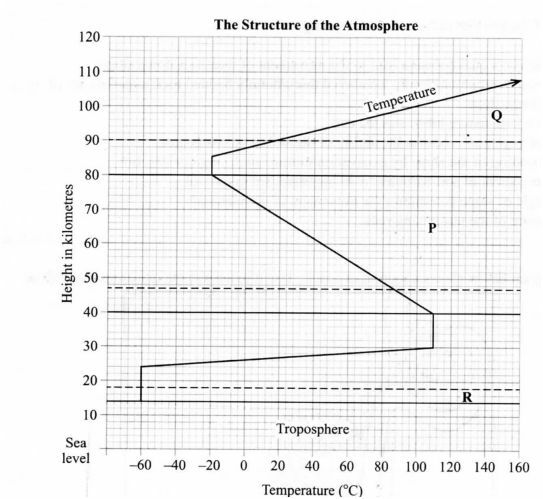 1. a) The diagram below represents the structure of the atmosphere. Use it to answer question (a). 3. 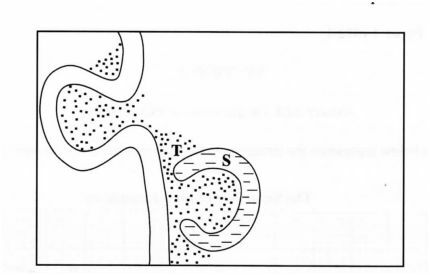 The diagram below shows a section of a river. Use it to answer the questions that follow. c) Describe the structure of the earth's crust. 8. a) What is volcanicity? c) Explain four negative effects of earthquakes. 9. a) What is vegetation? d) You are planning to carry out a ﬁeld study in a forest. 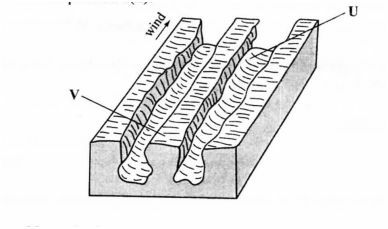 The diagram below represents features resulting from wind erosion in a desert. Use it to answer question a(ii). Answer question 6 and any other two questions from this section. 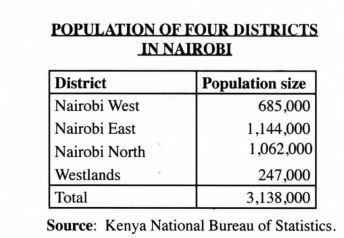 6 .The table below shows the approximate population size of four districts in Nairobi in the year 2009. Source: Kenya National Bureau of Statistics. 7. The map below shows the location of some minerals in East Africa. 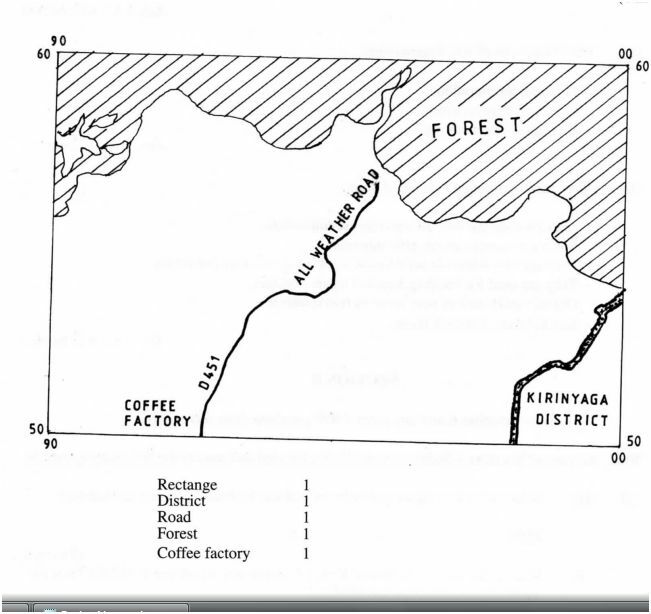 d) You plan to carry out a ﬁeld study in a tea farm. (d) Some students carried out a ﬁeld study on sources of energy by sampling the households around their school. (d) You intend to carry out a ﬁeld study in a nearby post ofﬁce. (ii) the pans marked P and Q. 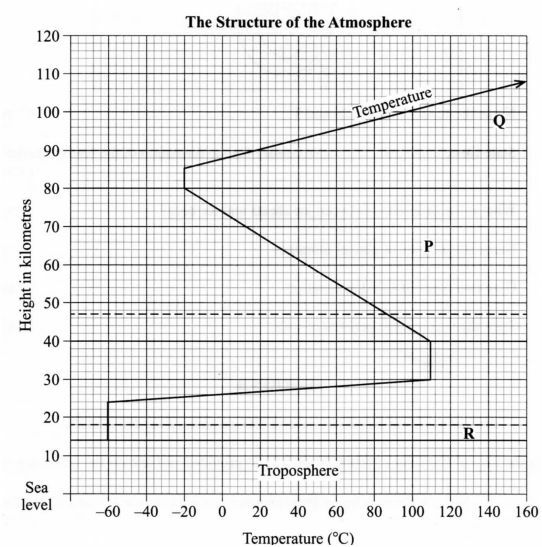 (ii) the layer of discontinuity marked R.
(b) State two characteristics of the weather conditions in the troposphere. Pressure falls with an increase in height. The speed of wind increases with an increase in height. 2.State ﬁve factors that inﬂuence mass wasting. Seisrnic/earth quake shocks lead to the movement of materials down slope. Increased overburden/deeply weathered thick/thinnly bedded rock materials are likely to move down slope. Increase in moisture lubricates the soil. Lack of vegetation reduces the ability of the soil to hold together. Under cutting of the slope by excavation/mining/quarrying/construction. Rearrangement of soil particles by living organism in the soil. The angle of slope determines the movement of the material. The nature of the underlying rock. 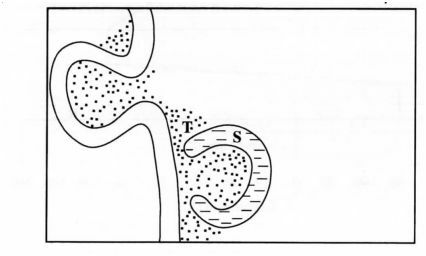 (a) Name the features marked S and T .
(b) State three conditions that are necessary for the formation of the feature marked S.
Presence of pronounced meanders in the ﬂood plain. Heavy load being carried by the river. A reduction in the river gradient/reduction in the river energy to erode vertically/ low velocity. Presence of obstacles in the river channel. Laterial erosion on the outer side of the river banks. Deposition on the inner side of the river banks. Periodic ﬂooding to cut off neck of pronounced meander. 4 (a) What is the difference between an ice sheets and an ice berg? (b) Name three types of glacial moraines. 5 (a) Give two types of soil degeneration. (b) State three economic beneﬁts of soils. They provide the base for crop/forest cultivation. Some are sources of valuable minerals. They are raw materials for ceramic / pottery / sculpture industries. They are used for building houses / roads / bridges. Organic soils such as peat serve as fuel resource. Salt licks are livestock feeds. 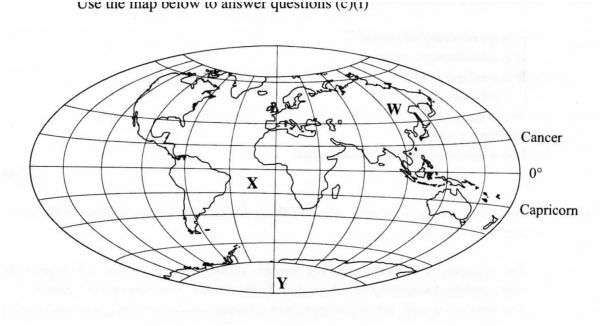 Study the map of Karatina 1:50.000 (sheet 121/3) provided and answer the following questions. (ii) What is the bearing of Mount Kenya Campus at grid reference 932568 from the cattle dip at grid reference 990529? (iii) Measure the distance of the railway line from the Level Crossing at grid square 8652 to the Southem edge of the map. Give your answer in kilometres. c) Describe the distribution of the natural vegetation in the area covered by the map. The high altitude / mountain a.rea is covered by thick forest/bamboo. The forest mainly covers the Northem/North Eastern part of the area covered by the map. There is a few patch of forest in the Southern/South Westem part of the area covered by the map. Woodland covers the North West, North/Eastem part of the area covered by the map. There are riverine trees along river Nairobi/Kaduni/Sagana. Scrub vegetation covers the South Westem part of the area covered by the map. Scattered trees cover the West/North Westem part of the area covered by the map. d) Identify two social functions of Karatina town. It is an educational centre. It is a residential centre. It is a religious centre. It is a health centre. 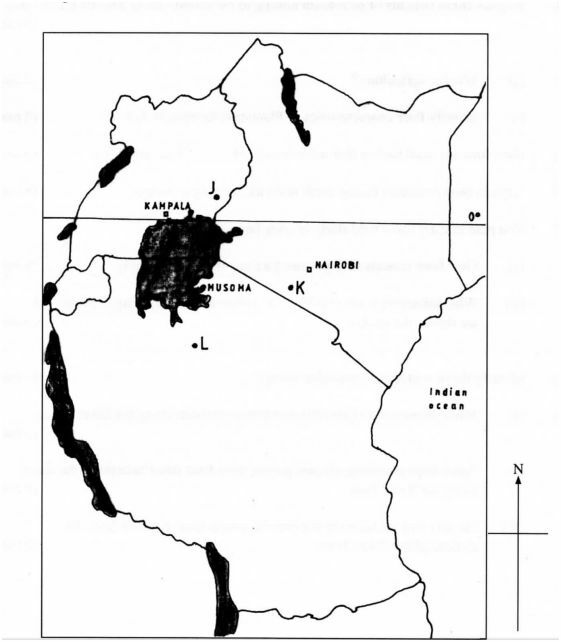 e) Citing evidence from the map, explain three factors that favour trading in the area covered by the map. The presence of numerous market centres / trading centres / shops which provide opportunities for trading (e .g Karatina, Tumu-Tumu, Kimahuri and Kagumo). The area has a well developed transport network for delivery of goods and services evidenced by all weather roads to Kerugoya, Sagana and Embu. The area is economically productive which provides goods as evidenced by tea/coffee factory, ﬁsheries department/ﬁsheries centre/research/cattle dip/murram pit. There are numerous settlements which suggests availability of markets for the variety of goods and services. 7 a) Name the ﬁrst two planets of the solar system. The explosion of the stars led to the formation of a huge cloud of gases (hydrogen and helium), dust and ice particles. This cloud whirled, cooled and condensed to a disc shape. The gravitational attraction within the materials increased cause the particles to compact. Some particles broke from the edge of the disc and whirled. The compacted particles swirled faster towards the centre of the disc in different directions. As they whirled they cooled or solidiﬁed to form the planets. This swirling caused particles to collide losing a little energy at a time. The middle of the spinning disc condensed to form the sun while the material . spinning around condensed into large chunks of materials called planetoids. The planetoids collided and coalesced into large bodies called planets. The centre of the disc formed the sun. the continent marked W - Asia. the ocean marked X - Atlantic. (ii) Give two reasons why the earth has a spherical shape. The earth experiences the force of gravity pulling towards the centre which creates a rounding effect on its shape. The North and South poles experience centripetal force which constantly pull towards each other causing the ﬂattening at the poles. At the equator the earth experiences the centrifugal force which causes the bulge. iii) State four effects of the rotation of the earth on its axis. NB: F can score on its own. “S’ must be tied to “F” to score. It causes difference in time between places over the earth’s surface. It causes deﬂection of winds / ocean currents. It causes differences in atmospheric pressure on the surface of the earth. d)Describe the structure of the earth's crust. It’s rocks are generally brittle/solid. The earth’s crust extends between 6 to 80 km. It is divided into two layers - sial (continental crust) and sima (oceanic crust). The sial contains mainly silica and aluminium. The sima contains silica, magnesium and iron. The sial is lighter/has a density of 2.65 to 2.70 gm per cc. The sial has mainly granitic rocks. The sima has basaltic rocks. The sima is fairly ﬂexible 8. a) What is volcanicity? b) (i) Apart from a sill, name three other intrusive volcanic features. Below the earth’s crust the rocks are at very high temperature and high pressure. If the pressure becomes less, the hot, solid rock material may become semi-ﬂuid / Magma under high pressure enters crustal rocks. The semi-ﬂuid rock / magma forces itself into horizontal cracksl ﬁssures. The magma cools and solidities in horizontal cracks or bedding plane. Rainwater enters the crustal rocks through cracks / ﬁssures. The water reaches a zone of hot igneous rocks. The water is (super) heated. The super heated water changes into water vapour. The vapour is under high pressure and so forces its way up heating the ground water. Lava pouring out of a central vent forms a volcanic cone. The vent may be sealed when lava solidiﬁes in it. The solidiﬁed plug block the gases and steam beneath from escaping. There is pilling up of pressure below the plug. The pressure leads to a violent eruption that blows off the top of the cone forming a depression. The resulting large circular depression on the top of the (now lower) volvano is called caldera. The magma resevoir below the crust is left empty/has a void/cavity. With time the weight of rocks of the volcano exerts pressure on the crustal rocks below. The pressure/earth movements cause cracks to develop making the volcano unstable. Over time the middle portion of the volcano subsides/collapses into the void fomting a depression. The resulting large circular depression on the top of the (now lower) volcano is called caldera. Volcanic eruption of ash and cinder/pyroclasts throough a central vent forms a volcanic cone. Several eruptions results to a high, steep and unstable volcano. The weight of the upper materials exerts pressure on the ones beneath causing instability on the lower part. The material at the base begin spreading outwards. The top of the volcano collapses inwards forming a depression. Violent motions resulting from earthquakes damage structures from their foundations leading to loss of life and property. When earthquakes occur faults may develop which damages infrastructure. During an earthquake on the sea ﬂoor vertical displacement occur leading to development of tsunami leading to ﬂoods of coastal areas/disrupts human activities loss of life/property. Earthquakes may lead to landslides which destroy agricultural land/loss of life/ damage of infrastructure..
Strong vibrations from earthquakes may cause damage to nuclear plants which pollute the environment and affect human health. High altitude areas have low temperature which encourage scanty / no vegetation / low altitude areas have moderate temperature which encourage dense vegetation. Gently sloping areas are well drained hence encouraging dense vegetation growth / steep slopes experience excessive drainage that discourage plant growth. Flat areas tend to be waterlogged hence covered by swampy plant species. Fertile soils have a variety of nutrients which encourage the growth of dense vegetation/infertile soils have insufﬁcient nutrients leading to scanty vegetation. Medium textured soils are well drained thus support a variety of plants /dense vegetation / coarse / ﬁne textured soils are poorly drained leading to scanty / no vegetation. Deep soils enable the penetration of long roots thereby supporting trees / thin soils support vegetation of shallow roots thereby supporting grass vegetation. c) Describe the characteristics of the savanna vegetation region. Vegetation is a mixture of trees and grass. The dominant type of vegetation is grass. In the wetter areas the vegetation consists of tall scattered trees, woodland. The wetter areas have a continuous cover of long thick grass. In the drier areas trees are shorter, fewer and scattered. In the drier areas the grass is short and coarse/tuft. Most trees are umbrella shaped crown. Along the river valleys there are tall trees, thick bushes. Most of the trees are decidious/shed their leaves. Grass withers/tums brown during the dry season. Grass sprouts with onset of rains. Some trees have small/waxy/shiny/thin leaves/thony spines. Some trees have long roots/tap roots. Most seeds are domant during dry seasons. d) You are planning to carry out a ﬁeld study in a forest. (i) Give four reasons why it is important to seek permission from the school administration. It is an ofﬁcial requirement. To enable the administration arrange for transport/lunch/meals. To enable the administration to provide entry fee if required. To enable the administration to provide essential tools for use. (ii) List three sources of information you are likely to use before the actual ﬁeld study. (iii) Identify four challenges you are likely to encounter during the ﬁeld study. Adverse weather conditions/too wet/too cold. Thick/thomy vegetation/rugged terrain may hinder movement within the forest. Tiredness due to walking long distances. Inadequate time for data collection. Getting lost/loss of direction to follow. (i) Name two major deserts found in Africa. 10. 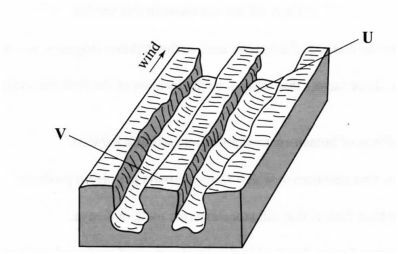 The diagram below represents features resulting from wind erosion in a desert. Use it to answer question a(ii). a) (ii) Name the features marked U and V.
b) Describe the three processes through which wind transports its load. c) Using a well labelled diagram. describe how a barchan is formed. It develops in arid areas when sand accumulates around an obstacles that lies in the path of the wind. The gradual accumulation of sand fonns a hill. Eddy currents on the leeward side of the dune causes the formation of a shallow depression / concave slope / steep slope. With time the prevailing wind forces the sand at the edge of the dune to move forward forming the homs. The continuous extension extension of the homs lead to a crescent shaped feature called barchan. (d) Explain four ways in which desert features are of signiﬁcance to human activities. Desert features f0m1 good sites for tourist attraction. thereby eaming foreign exchange. Wind deﬂation hollows/oasis are sources of water for domestic /agricultural use. Wind deposited sands / loess form fenile plains for farming. Salty ﬂats are economically used for salt production. Shifting sand dunes/hinder transport activities. Desert sceneries are ideal for ﬁlm making. The vast sand seas are ideal for military training/nuclear testing.